This lawnmower is great! I bought it a couple years ago after my first lawnmower broke down and I've been very pleased with it. My favorite feature of this lawnmower is that it is self-propelled. With my old mower, it took a lot of energy to push it around the house, but the scotts turf-vac3 practically pushes itself! The front two wheels spin forward, at different speeds you can choose, to propell the mower forward almost automatically, while still allowing you to easily handle the mower on turns by lifting up the front of the mower and rotating it on the back wheels. Another good feature is the easy start button. The mower has a little red button that you press just two or three times to prime the engine then it's ready to start. Just pull the cord and in one or two pulls the engine will start up, whereas many other models can take much more effort in order to start. This lawnmower also has a 6-stage height adjustment option on each wheel so you can determine how tall or short you want your cut to be. It is also durable, as I've had it for over two years without ever encountering any problems. All in all, the Scotts Turf-Vac3 is an excellent lawnmower that is well worth the price, which will run you around 200 dollars. My scotts 6.5 intek edge mower model 21595x8b briggs, starts fine but runs at full reps almost like it's about to blowup. Another thing is while doing this white smoke pours out of the exuast, I only let it run for a second or two because it sounds like its about to blowup .what should I do i love to fix things but don't no where to start? I am in need of a new float bowl bolt for my lawn mower, the head broke on mine when tightening after cleaning. It's a Scotts TurfVac Model #22965x8a. Any ideas where I can find this part? I Have this lawnmower for 15 years runs perfect, regular oil change and clean up still runs like a champ. I just pulled the Scotts Magna torque 6.4 hp self propelled mower out of the shed. I replaced the gas, oil and spark plug. after hitting the primer button twoo or three hundred times. It started!!! but... will not stay running. I pulled the air fliter and cleaned it. Any suggestions? I am a novice at this and think it may be the fuel filter. Transmission issues, Making the self propelled funtion not to work. Part is NLA on a mower that is 2 years old. beware! I was given a scotts lawnmover and it would not get gas in the carburetor i cleaned the carburetor and it still would not run so i rebuilt it and then i had gas comming out of the carburetor i found out the float had a hole in it so i put a new one on it and now it runs fine. I have a scotts turf vac3 front wheel propelled lawn mower and I need a belt and the front wheels.I saw the smae items, I need but it was for model#21595x8a. will the wheels and belt fit on my 21595x8b. Folks...I'm still looking for a manual in english for my Scotts Turf-VAC3 6.5 HP Self propelled lawnmover. How about some help in locating one. Contact me at: cds3217@aol.com. My mama thanks you; my pop thanks you and I do as well. 2 ONLINE WEBSITES TO FIND ALL REPLACEMENT PARTS!!! You can use this to find yours as well; just click on it (or copy and paste the link above into your browser) and put in your model number in the dialog box in the lower center of the page. You can download the PDF file for your mower's part list by doing a "File" "Save As..." from your browser, then go ahead and print it. Use it to find the part(s) that you need, whether it's wheels, handles, belts, whatever, and then go ahead and buy all of these replacement parts on the same site - www.outdoordistributors.com - also! They are very reasonably priced too. I've already been back and forth with a number of emails with them; they are friendly and very responsive, and their prices are a bit better than Outdoors Distributors (OD), so check them out. Their email address is willards@shakyparts.com. 302 - #710252 - WASHER, FLAT - I do not have this part available. 303 - #710140 - NUT (new part # 15x84) = $2.00 each. 305 - #710206 - FLAT WASHER (new part #17x120) = $2.50 each. Guys! Look! I've already posted (down below!) 2 different places online that you can go to get replacement parts!!! Doesn't anybody read the comments posted on this thing?!? You can find the wheels at your local Sunbirds. They have a varity of sizes. we love this mower. but parts are crazy to find. people act like theyve never heard of it. were looking for the front wheels. they ware out and cant find them any place. I'm sorry I didn't buy 2. I've had this mower since 2002, bought it as a "closeout" from Home Depot for 99 bucks. This has been one of the best mowers I have ever owned, I have 250 x 80 feet to cut and do most of it with a rider, and all of the smaller areas with this one. In addition my daughter picks it up every week or so in season and CUTS HER LAWN WITH IT. The battery for the electric start is too much money so I pull start it. It always starts 1st or 2nd pull, and the self propelled still works great. I'm only sorry I didn't buy 2.
serial # 7383810392Z00439. I replaced the spark plug & it won't start--what do I do now?? So now y'all have 2 sources for spare parts! P.S. - You can buy all of these parts on the same site - www.outdoordistributors.com - also! They are very reasonably priced too. I've found an online site called "Outdoor Distributors" (OD) that has parts lists and schematics in Adobe PDF document format for all Murray-made lawnmowers (yes, this includes the Scotts lawnmowers, made for Scotts by Murray). You can use this to find yours as well; just click on it (or copy and paste the link above into your browser) and put in your model number in the dialog box in the lower center of the page. You can download the PDF file for your mower's part list by doing a "File" "Save As..." from your browser. When I called the number, I received the after-hours message, "Welcome to the Murray Consumer Help Line". It directed me to the website, but didn't bother saying what the website URL address is (of course). Could they make it any harder? I've also got a TurfVac3, which has a broken right front wheel. The drive cam mechanism part is intact, but I need to get a new wheel to fit on it. The Model # is 21595X9A. Any help with pointing me in the right direction in terms of obtaining a replacement for this right front wheel would be greatly appreciated. I've already tried to find Scotts online, and the only thing I can find is a lawn & garden products site (fertilizer, plant food, herbicides, etc.) but no lawn mowers. I have a self propelled Scotts 6.5 mower, from Home Depot. I wonder if anyone has an owner's manual I can copy? The mechanism to engage the self propelled drive has fallen apart. THANKS! Best, Richard in Tennessee. Can anyone tell me the model num,ber for the Scott Tuff Vac3 self propelled mower I have the followin partial number 156?X8A. the rest is oblierated from the dewcal. Whoever heard of puting such an important number on a decal? Does anybody know where to get replacement wheels for this 3in1 self propelled mower by Scotts? I love this mower and could use the self propell now more than ever. One heart attack and two stents later Im learning. Contact me at jenos5neo.rr.com. Thanks and hope to hear from somebody soon as the cutting season is almost over for this year, (WHEW)!!! I just recently happened to purchase a turfvac 3 lawnmower at auction. If anyone is interested I am willing to part it out and sell the pieces individually as this is a second mower. 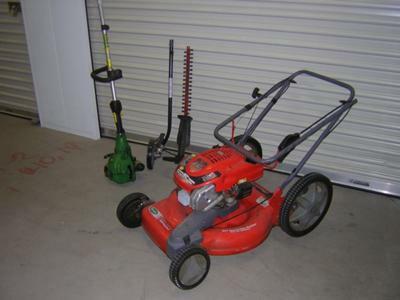 The mower had a minor gas-leak according to the auction description but was otherwise in running order. i cant find the belt? the piece that it rotates around came off but doesnt seem to stay put? what do i do! Sears Parts Direct seems to have everything that's still available for this mower. You can also easily find the manual and parts diagrams on-line if you are willing to look for them. Any independent mower shop should be able to order for you as well. I've bought parts from the Husqvarna and Toro shops to save $hipping. My self propel drive just broke. Can't decide if I need a new pulley or shaft/axle or if there's a pin that sheared off. Yes, excellent mower for 12+ yrs. I agree with everyone. I have had this mower for 10 years and it has been great. Only thing i have had to do is sharpen the blade. I recently broke the handle right where it attaches to the deck. Anybody have any Idea where i can find one? My wife bought our Scott 3 in 1 walk behind mower (w/o self propel option) about 13 years ago at The Home Depot and I would have to say that I've been very pleased with it. I've replaced the pull cord once and had to drill holes in the very ends of the grass catcher through rod (that the bag hooks on to)and put cotter pins through the holes that I drilled to hold it in place because the end cap keepers came off, the rod would come out which would allow the bag to fall off.Now I,m replacing the 8" wheels with new ones that I bought at Harbor Freight tools at a reasonable price.They where getting rather sloppy from hitting the gaps in wood slat fencing a few too many times because I was too cheap to buy a weed eater for getting closer to the fence.The only other thing I could think of that went wrong with it is that a few years ago it developed a little back fire and some smoke if I haven't used it a few months but it does't seem to affect its performance any.Too bad Scott went out of business or was bought out. Hopefully the the new owners make as good of a product. Ok, I was reading the posts and Im not sure if it would help you all or not. I have a Scotts Turf Vac3 3-N-1 Power propelled Mower. The drive belt ended up breaking and I was having a hard time finding parts because Murray bought out Scotts so you will not be able to find them if your looking for Scotts parts. I did not have any luck calling Lowes because they had no idea about any of that, atleast the person I talked to. You can actually access a parts catalog online through lowes in which they havd a parts list for my lawn mower and I was able to locate the part#, etc. that way. I ended up taking the part number to Southern States and they ordered it for like $20.00 cheaper than what I would have paid at Lowes. Hope this helps. My buddy owns a lawn business and loved this mower for those spots his zero turn could not reach. When the pull cord broke he bought a new mower and gave me the scotts self propelled. I need the screws that hold the orange cover on and the pull cord assembly beneath the orange cover. If you have one that you would like to sell, give me a call @ 318-2nine4-7905, i would love to purchase it from you and arrange shipping. Was giving this lawn mower a few years ago and I am having great trouble finding the belt to make the front wheels go self-propelled. One belt is too short and the next size up is too long. Where came I find this part. Need your help! I really enjoy mowing my lawn with this mower. What a headache finding parts. I need the belt to run the front wheels but have no idea what to get. I also need another pull starter (the round mechanism under the orange top plate). Any ideas where to get these? And for a good price. So where do I get parts? My brother just got one of these free and he broke the front wheel off. Instead of asking me if I could fix it he just threw the wheel away. Now he's asking where can he get a wheel? I have one and my left wheel adjustment broke. I can't find the part anywhere. I have owned this mover for 12 years and love it anyone know where I can get the part. To the last poster - scunningham at simdata.net is my email - Im interested - Inherited my lawnmover and its missing some parts to I do not know if it even works. Gotta buy a new lawnmower! Bought in 2000 Scott 6.5 self-propelled walk behind lawnmower with electric start for about #349.00 then. It ran really well and really liked it. The transmission seems to have gone out last season however and it needs repair, otherwise it's still a good lawnmower. Took it to a repair shop and they said the Scott company went out of business (as well as Tecumseh Engine Company) and there were no parts available. Found the part code for the transmission but it's $85.00. I don't know if that's all I need so I'm thinking I'll put it to rest. Anyone need a good Tecumseh 6.5 engine? I hate throwing this stuff in the trash. The Tecumseu Company went out of business because of a cash dispute among the owners. The company was then sold and we have to pay (NEW LAWNMOWER)! I bought this lawn mower about 8 years ago.This is my first mower as a home owner and this mower is one tough lawn mower. this three in one does a great job in the summer and the fall.